"Hold the burgers, hold the fries, TGI are telling lies." "Hold the burger, hold the ribs, TGI are telling fibs." Restaurant chain TGI Fridays has cut staff tips. When you tip using card at TGI, 40% of what would normally go to waiting staff now goes to kitchen workers. TGI isn't interested in helping low-paid kitchen staff. The new scheme was only brought in after TGI cut kitchen staff pay, provoking a recruitment crisis. Young waiting staff are paid as little as £5.90 an hour. 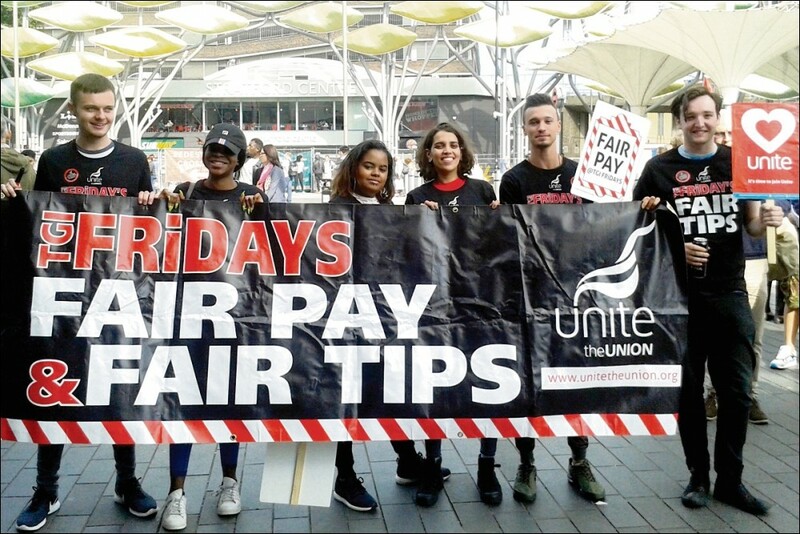 Kiran Dhingra-Smith, a Unite the Union rep at TGI Stratford, told the Socialist that she is down £900 in lost tips since March while her restaurant takes £100,000 a week. In addition, workers are on their feet for an outrageously long time without a break. 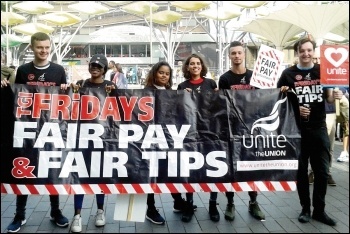 TGI workers have joined Unite and taken strike action at several restaurants against the outrageous tip policy. Workers at TGI Stratford were striking for the first time on 24-26 August. All who have joined the union were on the picket line alongside 30 supporters. Socialist Party members Suzanne Muna and Rob Williams spoke to offer their solidarity from the Unite executive committee and National Shop Stewards Network respectively. We marched past the restaurants, up and down the outskirts of the enormous Westfield shopping centre to whoops, cheers and applause from the people around. On the second day of the strike, Westfield management organised a blockade when the workers tried to march past the shopping centre again. But security guards voiced support for the strike. Jennifer Batista, Team leader, TFI Friday, and Unite the Union member spoke to the Socialist: "I'm striking here because I've been in the company for two years now and I've seen a dramatic change in the way company treat us, in tips, in wages, conditions, all sorts. And I'm here with the rest of my team because we want to fight for our future here at TGUI Fridays. We love the company but it's the way that we are treated. We're not heard and it's getting worse, so we need to speak out now. "It was the 40% trunk scheme that threw us over the edge - it's to do with taking 40% of our card tips on a weekly basis. The company estimated it would take £9 a week from our wages but in the end it takes around £40 -£50 and that's a dramatic change for us. We've got bills to pay. That's a major reason why we are here."